There was just one promotional quote on Shaun Of The Dead’s theatrical poster here in the states: “An absolute blast!” —George Romero. 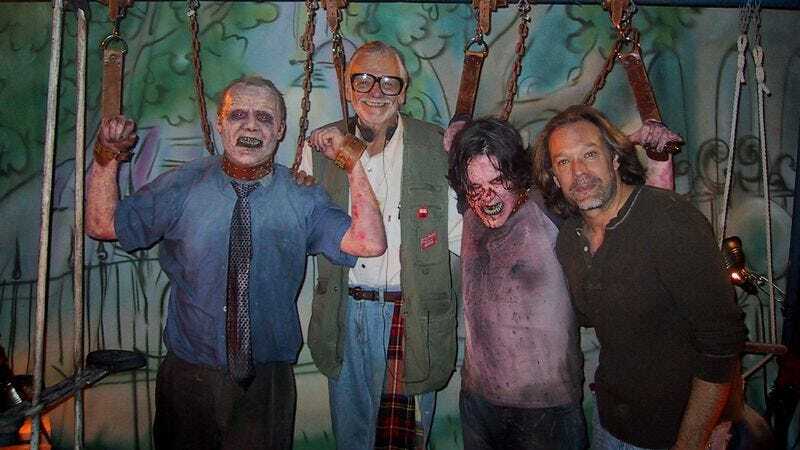 Reading director Edgar Wright describe his conversations with and gratitude toward the late horror icon, you get the feeling that’s the only positive review he ever really cared about. In a touching tribute to Romero posted on his personal blog, Wright recalls the story behind that quote and just how much it meant to him. Obviously, Shaun Of The Dead owes a huge debt to Romero—Wright describes it as “taking place in George’s universe”—and once it was completed, Universal Studios, the movie’s U.S. distributor, managed to set up a screening for Romero, who later called Wright in London and praised the film. “I frequently think back to this moment of standing in my house as the moment my life truly changed and the world got smaller,” Wright wrote. Even more heartwarming is the story of Wright and Simon Pegg’s cameo in Land Of The Dead. The two superfans donned their zombie makeup and met the master. “We had sent George a ‘Foree Electric’ name tag as a token of our gratitude for his poster quote on our movie and he was wearing it when we met,” Wright wrote. “Meeting the man himself was just amazing, as anyone who knew him will attest how funny, smart and genial he was.” Wright also shared a delightful email exchange between the two directors about Romero’s forthcoming star on the Hollywood Walk Of Fame. Romero’s hilariously written response is a perfect showcase of that wit.